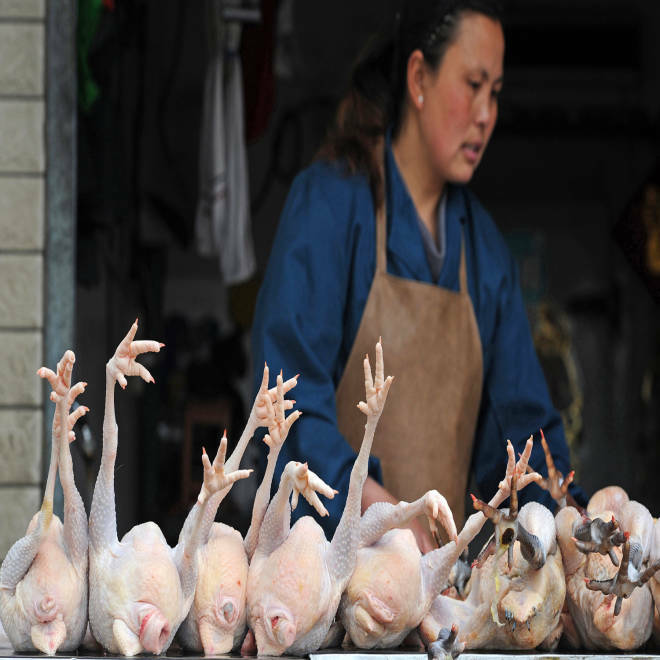 Chinese authorities have closed some live bird markets in an attempt to stop the spread of a deadly strain of bird flu. A vendor, above, washed a chicken stall in a poultry market in Hefei, China, shortly before it was due to be closed Thursday. BEIJING -- It began in late February when an 87-year-old man started coughing up phlegm. A high fever followed, he struggled to breathe and was dead just 13 days later. His death in Shanghai, China, was one of 13 fatalities out of 41 known cases to date of a new form of bird flu that experts warn may pose a "serious human health risk." On Saturday, China's center for disease control announced the first case in Beijing, and outside of eastern China. The seven-year-old girl, whose parents work in the live poultry trade, was stable in a hospital in the capital, media reports said. Around the world, scientists are now beginning to examine samples of the virus with a significant question in mind: Could this strain of the disease cause a global pandemic? This international network of scientists keeps constant watch for good reason. In 1918 and 1919, a flu pandemic killed between 20 million and 40 million people, more than the total death toll of World War I, more in a year than the Black Death of 1347 to 1351. More recently, an H1N1 swine flu pandemic was blamed for more than 284,500 human deaths worldwide between April 2009 and August 2010. So far, the signs are that this is a localized outbreak. The number of cases is low and the virus -- an H7N9 strain -- does not appear to be capable of jumping from one person to another. But each case represents a chance for the virus to mutate into one that is highly infectious in humans. And it is an unusual strain -- normally avian diseases make birds sick first, giving an early warning sign, but this one does not. More than 1,000 dead ducks have been fished out of a river Sichuan, China. The discovery comes as the country deals with anger over the dumping of over 16,000 pigs elsewhere in China. NBCNews.com's Dara Brown reports. Scientists have established it is from an "avian reservoir" but still don't know the precise source. Chinese officials have dismissed suggestions of a connection with the large number of dead pigs and other animals found recently in rivers. Many in China are understandably worried, with some deciding to avoid eating chicken, even though it poses no threat if properly cooked. Even Jiangsu Zoo, just north of Shanghai, reportedly stopped feeding chicken to animals such as lions and tigers and started giving them a traditional medicinal herb called ban lan gen.
“Now, we only eat vegetables," she said. "My daughter's school is measuring students' temperatures. We were told that we should eat less eggs or not touch eggs because they might have some excrement from chickens." But others in the city of 23 million people were more sanguine. A farm in China has admitted to dumping more than 6,000 pigs corpses into Shanghai's Huangpu River, according to China's official Xinhua news agency. NBCNews.com's Alex Witt reports. Yan Zhanlin, a 40-year-old businessman, said he was “not scared, because there are not many cases, and the number of deaths is not high” and the virus had not yet spread between people. “Today, I went to a train station, and I only saw few people wearing masks,” he said. Tang, a company manager in his late 20s, who declined to give his full name, was also relatively unconcerned. “I do not fear [the virus] at all. It is just a kind of flu, and will pass quickly,” he said. Avoiding poultry was “not too bad, because it forces us to eat vegetables and fish, which are nutritious,” he added. Perhaps in a sign of the country's nervousness, People's Liberation Army Colonel Dai Xu claimed the U.S. was behind the outbreak, saying the U.S. had used "bio-psychological weapons" to cause the deadly 2003 Sars outbreak and the current flu one, The South China Morning Post reported. Such allegations aside, this apparently local problem is being treated seriously on a global scale. Samples of the virus – or non-infectious nucleic acid from it — are being sent to scientists in up to 140 national influenza centers recognized by the World Health Organization, including the Centers for Disease Control and Prevention. Work has already started in the U.S. to make a vaccine against the new strain -- just in case. Scientist John McCauley, of the U.K.’s National Institute for Medical Research, received his consignment on Thursday. “We’re watching very carefully the events there [in China] because we are aware although there’s no human-to-human transmission, these are unusual infections people have been getting from an avian reservoir,” he said. 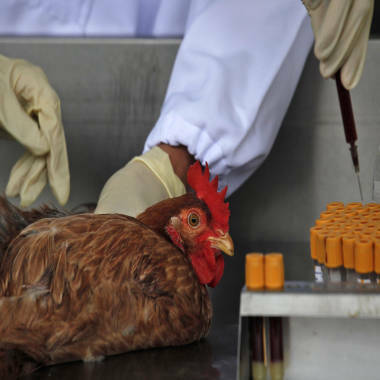 The outbreak of a new strain of bird flu has now infected at least 18 people, and killed six in China. NBC's Robert Bazell reports. “In the meantime, the national influenza centers around the world are developing their ability to detect this newly emerging virus” and also working on vaccines, McCauley said. Experts needed to find out how vaccines would perform “in case this virus becomes pandemic,” he said. Coincidentally, John Oxford, a professor of virology and an expert on the 1918 flu pandemic, was in Shanghai about eight weeks ago -- roughly the same time that the elderly man first fell ill – for a meeting about hygiene, important in the fight against viruses such as flu. “So far there’s no human-to-human transmission. What’s tomorrow going to bring, what’s the next day going to bring? You don’t know and I don’t know,” he added. “I don’t think we should start thinking of 1918 scenarios, definitely not,” he said. Officials from the Center for Food Safety get a blood sample from a chicken imported from mainland China at a border checkpoint in Hong Kong on Thursday. However – mirroring the split on the streets of Shanghai – other experts were less worried. Adolfo Garcia-Sastre, a microbiology professor at Mount Sinai School of Medicine in New York and principal investigator for the Center for Research on Influenza Pathogenesis, said while it was “too early to be able to conclude anything … the probabilities are very low” that a global pandemic is looming. He was comforted by the lack of a surge in the numbers of people with the disease. “It’s not that it’s increasing by ten times per week, I think right now the number of cases is what you would have expected from the original numbers,” he said. Ian Johnston reported from London.